Department of Pediatrics, Hamad Medical Corporation, Doha, Qatar 3050. Hendaus MA, Zahraldin K. Chryseobacterium indologenes Meningitis in a Healthy Newborn: A Case Report. Oman Med J 2013 Mar; 28(2):133-134. Chryseobacterium indologenes is a rare cause of infection in infants. The majority of case reports belong to hospitalized infants with indwelling devices. We are presenting a rare case of Chryseobacterium indologenes meningitis in a healthy newborn with no neonatal intensive care unit admissions or indwelling devices. The pathogen is resistant to many antibiotics and the patient was successfully treated with cefepime. This is the first case of C. indolegenes meningitis presented in a newborn with no indwelling device, NICU or long-term broad spectrum antibiotics. The choice of antibiotics can be challenging since the pathogen may exhibit resistance to a number of antibiotics. Globally, Chryseobacterium species affect individuals exposed to contaminated medical devices such as humidifiers, endotracheal tubes,1 catheters and prosthetic valves.2 Other risk factors include prolonged use of antibiotics.1 To the best of our knowledge, this is the first case of C. indolegenes meningitis in a healthy newborn with no indwelling device, neonatal intensive care unit (NICU) admissions, or prolonged use of antibiotics. An 8 days old female brought from home to the emergency department at Hamad Medical Corporation due to fever and hypoactivity for two days. The fever started as intermittent and then became persistent. The mother did not have a thermometer at home so fever was reported as tactile. However, there was no vomiting, diarrhea, cough or runny nose. Past medical history noted that the neonate was born via normal vaginal delivery at thirty six weeks gestational age and the mother and baby were discharged the following day in good condition. Family history, including immunodeficiency disorders was not significant, and the mother’s prenatal care was unremarkable. On admission to the ward, the vital signs were as follows: temperature was 39ºC; pulse was 144/min; blood pressure was 76 mmHg /45 mmHg; Respiratory rate of 34/min; Head circumference of 33.5 cm (25th percentile); weight of 2.7 kg (10th percentile); and length of 48 cm (25th percentile). The infant looked pale, irritable, and was crying with sunken eyes. The rest of the physical examination was normal including an open and flat anterior fontanelle, with normal neurological exam and supple neck. Initial laboratory results were as follows: complete blood count showed white blood cell (WBC) of 19700/uL; red blood cell (RBC) was 5600000/uL; hemoglobin was 19.8 g/ dL; hematocrit of 56%; mean corpuscles volume of 100 fl; mean corpuscular hemoglobin was 35.4 g/dL; Red Blood Cell Distribution width (RDW) was 16%; and platelets were 241000/uL. The WBC differential was composed of neutrophils (79.2%), lymphocytes (16.4%), monocytes (3.5%), and basophils (0.1%). Serum glucose, blood urea nitrogen, creatinine, calcium, sodium, potassium, chloride, total protein, ammonia, lactic acid, liver function test, glucose-6-phosphate dehydrogenase, neonatal screening and albumin were all normal, as well as arterial blood gas. Since the patient was admitted for neonatal fever and irritability, a full sepsis work up was conducted as per our protocol. The cerebrospinal fluid (CSF) protein was 3 g/L and glucose level was 0.90 mmol/L; the CSF gram stain was reported as negative; while the CSF cell count showed WBC of 7800/µl, with differential of neutrophils (75%), lymphocytes (3%), monocytes (19%), eosinophils (3%). CSF RBC was 1200/µl. The CSF culture grew Chryseobacterium indolegenes (Fig. 1), sensitive only to cefepime and trimethoprim/sulfa and resistant to amikacin, cefotaxime, gentamicin, and meropenem. A viral polymerase chain reaction (PCR) was conducted on the CSF as part of the septic work-up to check for Herpes simplex 1 & 2. CSF PCR was negative, as well as blood and urine culture. On the day of admission, the patient was started on ampicillin and cefotaxime but on the third day of hospitalization, we switched the antibiotics to cefepime per CSF culture results. The fever resolved two days after the initiation of cefepime and the antibiotics management continued for a total of three weeks. Oral intake improved and the patient was discharged in good and stable condition. There was a follow up in the outpatient clinic two weeks after hospital discharge and the infant was in a good clinical state. The majority of cases reported were among adult patients; however, there are a few cases reported in children. Bayraktar et al.6 reported C. indolegene bacteremia in a five month old male who was contaminated by the hospital water. While Cascio et al.7 presented reported of a two year old male with Type 1 Diabetes Mellitus who developed C. indolegenes bacteremia and the only indwelling device was a peripheral catheter. In addition, Ceylan et al.8 described a case of sepsis caused by Chryseobacterium indologenes in a patient suffering from hydrocephalus with ventriculoperitoneal shunt. Sudharani et al.9 mentioned a case of C. indolegenes in a preterm baby on a ventilator and Al-Tatari et al.10 disclosed a case of lumboperitoneal shunt infection with C. indolegenes. The SENTRY Antimicrobial Surveillance Program showed that the most active antimicrobial against Chryseobacterium isolates were the quinolones, especially the newer agents (levofloxacin, garenoxacin and gatifloxacin); each with a Minimum inhibitory concentration (MIC) of 1 micro g/ml, at which 90% of the isolates are inhibited [MIC(90)] and exhibit 98.0% susceptibility; followed by rifampin (85.7% susceptibility), piperacillin (85% susceptibility), ceftazidime (85% susceptibility), and cefepime (85% susceptibility).1 However, a study conducted by Chou et al.5 on ten patients in the intensive care unit showed all the isolates of C. indolegenes were 100% susceptible to minocycline and trimethoprim/sulfamethoxazole. Other antibiotics were checked for susceptibility to the pathogen and the results were as follows: Vancomycin, ceftazidime, cefepime, meropenem, piperacillin, and amikacin (0% susceptibility), imipenem (10% susceptibility), piperacillin/tazobactam (20% susceptibility), ciprofloxacin (30% susceptibility), and levofloxacin (30% susceptibility). This is the first case of C. indolegenes meningitis presented in a newborn with no indwelling devices, NICU or long-term use of broad spectrum antibiotics. The choice of antibiotics is a challenge since the pathogen may be resistant to a list of antibiotics. C. indolegenes should be incorporated in the list of organisms in cases where a newborn is not responding to the most commonly used empiric antibiotics regimen for meningitis. The authors reported no conflict of interest in any form and there was no financial relationship with any company to disclose. 1. Kirby JT, Sader HS, Walsh TR, Jones RN. Antimicrobial susceptibility and epidemiology of a worldwide collection of Chryseobacterium spp: report from the SENTRY Antimicrobial Surveillance Program (1997-2001). J Clin Microbiol 2004 Jan;42(1):445-448. 2. Hoque SN, Graham J, Kaufmann ME, Tabaqchali S. Chryseobacterium (Flavobacterium) meningosepticum outbreak associated with colonization of water taps in a neonatal intensive care unit. J Hosp Infect 2001 Mar;47(3):188-192. 3. Christakis GB, Perlorentzou SP, Chalkiopoulou I, Athanasiou A, Legakis NJ. 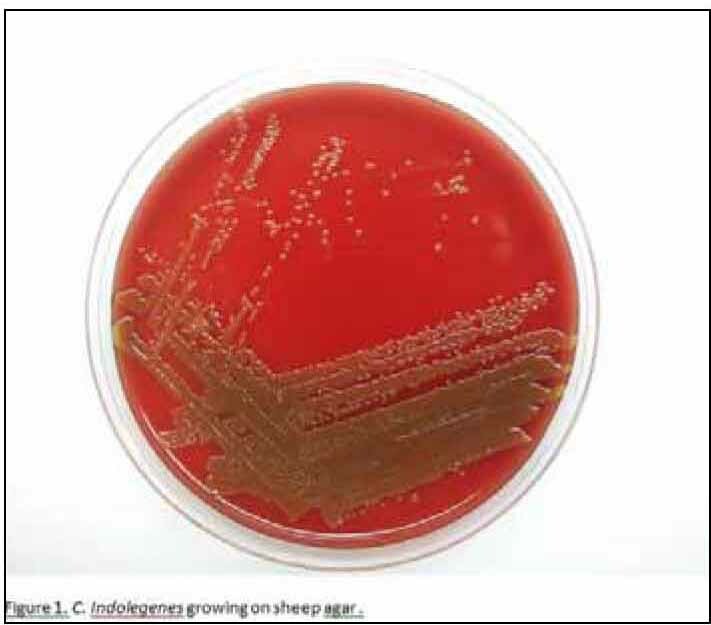 Chryseobacterium indologenes non-catheter-related bacteremia in a patient with a solid tumor. J Clin Microbiol 2005 Apr;43(4):2021-2023. 4. Bernardet JF, Hugo CJ, Bruun B. (2010). Genus X. Chryserobacterium Vandamme, Bernardet, Segers, Kersters and Holmes 1994. In Whitman WB, Krieg NR, Staley JT, Brown DR, Hedlund BP, Paster BJ, Ward NL, et al. (Eds.) Bergey's Manual of Systematic Bacteriology; Volume 4 (Vol. 4, pp. 180-192). New York: Bergey's Manual Trust. 5. Chou DW, Wu SL, Lee CT, Tai FT, Yu WL. Clinical characteristics, antimicrobial susceptibilities, and outcomes of patients with Chryseobacterium indologenes bacteremia in an intensive care unit. Jpn J Infect Dis 2011;64(6):520-524. 6. Bayraktar MR, Aktas E, Ersoy Y, Cicek A, Durmaz R. Postoperative Chryseobacterium indologenes bloodstream infection caused by contamination of distillate water. Infect Control Hosp Epidemiol 2007 Mar;28(3):368-369. 7. Cascio A, Stassi G, Costa GB, Crisafulli G, Rulli I, Ruggeri C, et al. Chryseobacterium indologenes bacteraemia in a diabetic child. J Med Microbiol 2005 Jul;54(7):677-680. 8. Ceylan A, Güdücüoğlu H, Akbayram S, Bektaş A, Berktaş M. [Sepsis caused by Chryseobacterium indologenes in a patient with hydrocephalus]. Mikrobiyol Bul 2011 Oct;45(4):735-740. 9. Sudharani V, Saxena NK; Asiya. Chryseobacterium indologenes bacteraemia in a preterm baby. Indian J Med Microbiol 2011 Apr-Jun;29(2):196-198. 10. Al-Tatari H, Asmar BI, Ang JY. Lumboperitonial shunt infection due to Chryseobacterium indologenes. Pediatr Infect Dis J 2007 Jul;26(7):657-659.